This is an independent review of the Blooming Bath baby bath mat. All thoughts are the author's. This post is not sponsored. When I was creating our baby registry while pregnant with my son, I didn't give much thought to a baby bath. I simply added the simplest and most affordable baby bath tub to the registry, assuming that we wouldn't need anything fancy to bathe the baby in. Then, at our baby shower, we received not one, but three, baby bath tubs - one of which was the Blooming Bath. I was intrigued by how different it was from the typical baby bath tubs you see on the market. For starters, it was soft and aesthetically pleasing, which I liked. Honestly, though, I didn't realize just how much easier and stress-free the Blooming Bath would make bath time until my baby arrived. Even though my baby boy was a heft 9 pounds at birth, newborns are still fragile. Add to the mix two new parents who have no idea what they're doing, plus warm water - which is dangerous for babies for obvious reasons - and it made bath time in the traditional tub a constant source of anxiety. After a few weeks of dreading bath time, I busted out the the Blooming Bath. Yes, water is still involved so you still have to be careful. 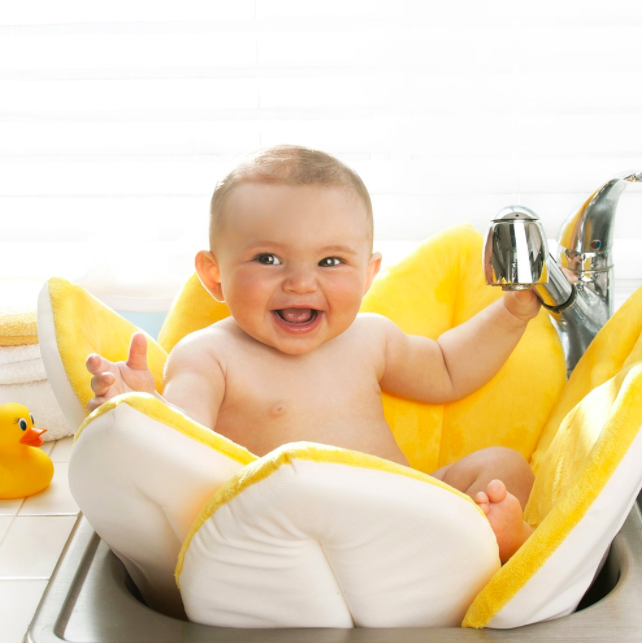 But, bath time became more enjoyable for everyone when we introduced the Blooming Bath, the main reason being that I was no longer afraid that my baby would slip beneath the water. Additionally, since the petals on the Blooming Bath form to fit the sink, I imagine it makes bath time much more comfortable for baby. After all, the plush material is much softer than a hard, plastic tub! Our son outgrew the Blooming Bath in the kitchen sink around 5 months of age, but we can still use the Blooming Bath in our regular bath tub. We simply lay the bath mat flat in the tub, and our son, who can now sit unassisted, sits on the mat. Of course, we still have to supervise, but I'm less worried about a baby, slick with soap, slipping backward and hitting his head on the side of the tub or faucet. The only drawback is that after bath time, the bath mat is naturally sopping wet, but its large size makes it difficult to wring out. As a result, I often find myself dripping water onto the floor as I struggle get the excess water out. Still, it's a small price to pay for an otherwise easy bath time routine. And, the good news is that the bath mat can then be hung to dry or simply thrown into the washing machine for easy cleaning. I'll definitely keep using the Blooming Bath, and I recommend it to any new parent.